At last the Zone Ranger has found a low carbon vehicle, for getting about town. 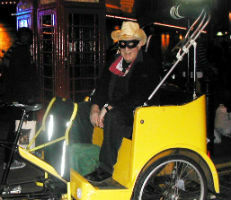 He has rounded up a whole herd and is driving them up to Muswell Hill Broadway for Saturday 31 March 2012. This is when the shops in N10 are going green and putting on festive entertainment and offering specially discounted merchandise. These cycle-powered rickshaws will help you do the rounds. And make sure you visit the LCZ Green Grotto (aka the Crocodile Café) where we will be celebrating the end of our work in the Zone, with music, freebies and awards presented by a BBC celebrity. To find out more, email lowcarbonloan@haringey.gov.uk or call on 020 8489 3260 but, above all, MAKE SURE YOU ARE SOMEWHERE NEAR THE CROCODILE CAFÉ BY 3.30 OR YOU MAY MISS THE HILLFIELD FOLLIES, THE AWARD CEREMONY AND THE BEAUTIFUL BROADCASTER.